If You Have Green Eyes This is For You!..... Works for other eyes too! 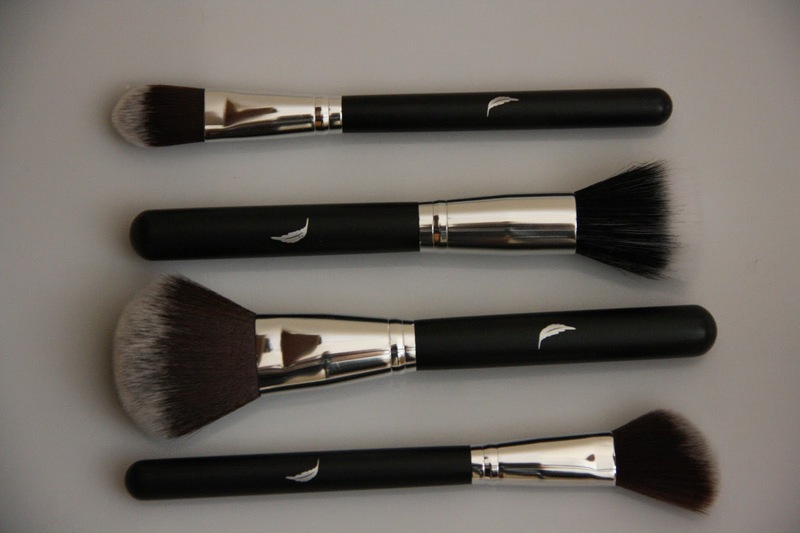 Featherstroke's Ultimate Big Brush Makeup Brush Set - Be assured that your canvas supports your portrait! Exactly How Perfect Are Your Touch-Ups? Following the overwhelming success of Featherstroke's Complete Makeup Brush Set, customers were keen to ensure that their makeup was maintained throughout their busy days and even into the evenings. In response, Featherstroke has introduced a Compact Makeup Brush Set to compliment its range. Compact Makeup Brush Sets are ideal for both on the go applications to support busy lifestyles and when travelling. 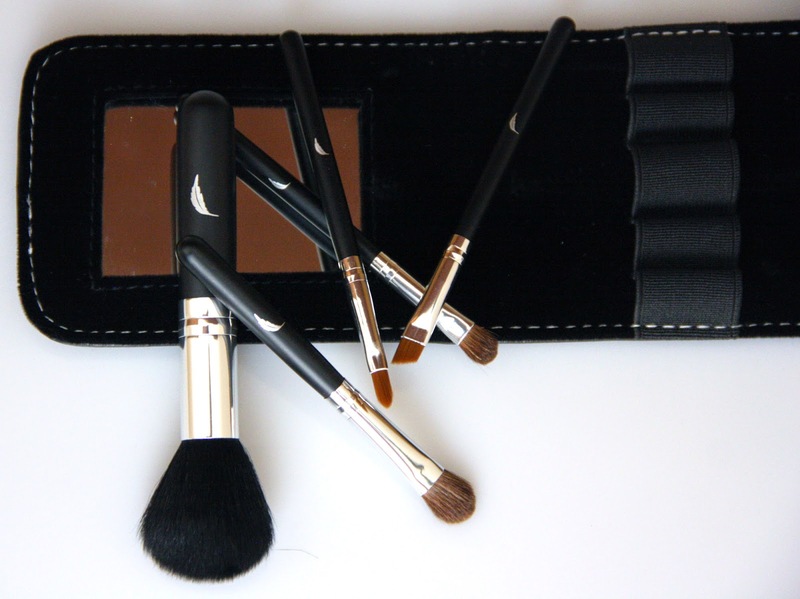 Not only do these touch-up brushes fit easily into purses but are ideal for convenient and discreet use, particularly when the pouch incorporates a compact mirror. The Medium Eyeshadow Brush. This natural hair, cosmetic brush is used to pack on color, shade and blend product on the eyelid. The Small Tapered Eyeshadow Brush. This natural hair eye makeup brush is used to distribute eyeshadow evenly on smaller areas of the eye as well as the crease line. 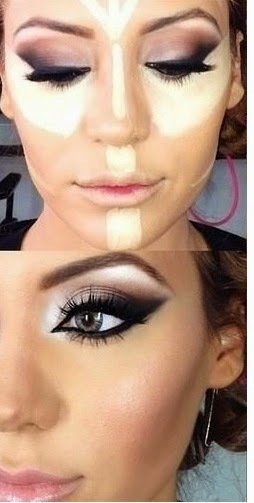 The brush can also be used for highlighting the eye. The Powder Brush or Face Blender (Multi-function Brush). The bristles of this soft natural hair brush are arranged in a dome shape and are tapered which ensures both optimal product pick up and accurate application. This brush can also be used as a bronzer brush, blusher brush, in addition to being a powder brush. The Oblique Eyebrow Brush. This synthetic bristle, oblong makeup brush makes ideal application easy and produces a smooth natural look. This brush is used to shape and groom the eyebrows and to define and add 'fill'. This brush can also be used as an eyeliner brush. The Lip Liner or Lipstick Brush. The soft bristles of this synthetic brush blends color evenly and naturally for a beautiful 'bitten' lip look. This cosmetic tool is used for filling in lip color, lip gloss or lipstick, to define and gorgeously enhance the lips. This cosmetic brushes set is presented in an attractive, easy to clean, mirrored pouch, with contrasting stitching. Like its predecessors, the Featherstroke Compact Brush Set is also receiving rave reviews from customers. To quote just one, Ms. L. Bawden says "This compact makeup brush set is by far the most used and most handy thing in my handbag, I always make 100% sure that it is with me wherever I go!"